Porridge, we all know that it one of the healthiest breakfast around. Yes, yes, yes - I agree that oats is immensely rich fiber and all the other goodness but it gets monotonous to have the same breakfast every day. Something to satisfy the chocolate cravings with fruity additions, sweetened with intense earthy honey is definitely what I want for breakfast. As far as food is concerned, pleasant visuals gets a thumps up from me even before I taste it. I can see that I am getting a positive nod from anyone who is reading this, most of you would agree with me, isn't it??? Caribbean porridge - the name itself sounds so exotic. It is from the cookbook by Levi Roots who is a "Reggae singer" and a "Celebrity Chef". His book "Caribbean Food made Easy" reflects soulful Caribbean cooking with traditional simple ingredients. Dotted with beautiful photographs of the Caribbean islands, the people with their innocent smiles, breath taking landscapes, sandy white beaches, market scenes with all the bountiful produce on display and food stalls. The recipes are very simple resembling Indian cuisine in more ways than one. This porridge calls for exotic spices and mellow coconut milk which gives an absolute new flavour to this humble porridge. The recipe is adapted a little according to the ingredients in hand. The strawberry puree and the honey are extra additions suited for my taste. Cinnamon stick: 1 inch piece. 1. Heat the water in a pan with the spices. Let it come to a boil. 2.Reduce the flame and add the oats. 3.Simmer and stir until cooked. 4.Remove from flame. Remove the spices with the help of a spoon. 5.Add the coconut milk and stir well. Keep warm until serving time. 1.Hull and wash the strawberries. Whizz along with the powdered sugar to a puree. 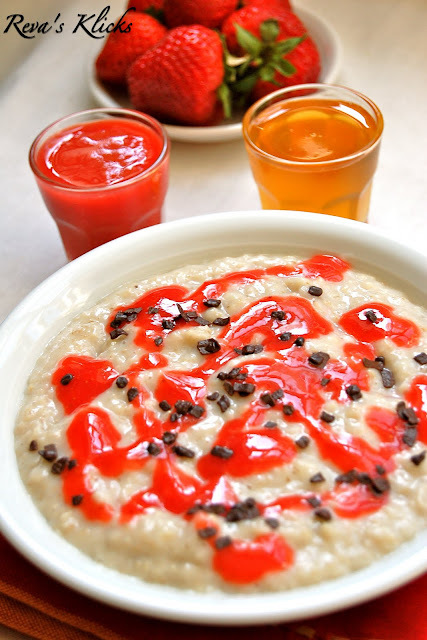 Cooked porridge and strawberry puree. 1.Mix the porridge with around 3 tbsp of honey. In the serving bowl pour the cooked aromatic coconuty porridge until half full. 2.Top with a thick layer of strawberry puree. 3.Top with the remaining porridge. 4.Drizzle with 2 tbsp of strawberry puree and honey. wow such an aromatic porridge n with sauce its too goood n yumm..
Wow.. looks so good... oats is my regular breakfast.. like this version of spicing it up!! That looks toooooooooo good to start the day. Such pretty colors ~ love the spices in there n your pics are always a stunner! Bright and colourful images....Especially like the one of the honey being poured in. yummy yum porridge n lovely presentation too!! mmmm.... amazing clicks dear. You rock. Delicious and lovely looking porridge. What an awesome looking porridge dear. Can't take my eyes off this eye catching decoration. Wonderful recipe,looks so healthy and delicious.Nice presentation too. What a lovely and aromatic porridge recipe...love the pictures as well..
A very innovative and fresh porridge..I loved the entire ingredients going into this..Absolutely mind blowing breakfast ! Perfect for the breakfast....Pics are awesome..
Wow! never heard of this porridge. Looks so yummy with strawberry.. The 20th 'wonderful friend';) says that your space is a real fest for the eyes with lovely, awesome posts and pics!! ...the way the honey drops down the spoon..waah!! tooo good! ..now I've to get back to the recipe :)..
Quite an unusual combo,looks absolutely comforting and filling..
That looks awesome...what a way to have oats...beautiful clicks..
A great way of inviting the morning with a delectable breakfast like this. Awesome pics. love this idea of porridge. looks delicious.